At the same time, the expedition was a good test for our newly built boat in her natural conditions and habitat. If not for this trial, our archaeological experiment would remain inconclusive, leaving the consistency of reconstructed withy-sewing technique under some doubt. So we did not take shortest rout for our voyage, on the contrary, we strived to use all available time up for more sailing. The resulting route was following: Koskosalma - Kuganavolok - [land transport] - Kashino - Povenets - Kizhi - Olen Isles - Petrozavodsk - Povenets - [towed trough Belomor canal] - Belomorsk - Solovki - Sonostrov - Krasnaya bay - Solovki. 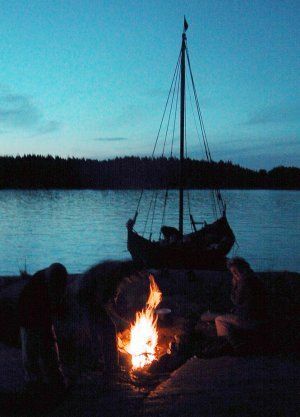 Along Onego lake and White sea shnjaka covered some 900 km, under her own sail, moreover, part of this way (200 km) she towed another 8 meter boat. Total sailing time, with anchor hoisted, amounted to ~220 hours, which puts average travelling speed at ~ 4 km/h. Not very impressing, but this result can be stated in more optimistic fashion – our daily average progress was 100 km (4.1km/h * 24h = 100km). Highest speed in this expedition, sustained for some 10 hours, was 6-7 knots, or 11-13km/h. The trip was definitely an interesting one, and I’m happy to hear they were able to reach the White Sea even after the bureaucratic issues at Stalin’s Channel. Time constraints forced me to leave the ship after the Onega leg. 27 June 2005. 2 minute read. 2005-06-27 17:45Z: Anchored for the night at N61.49,45 E36.06,73. We have made a tent out of the sail and wait on river Vodla for the forecasted SE wind. 24 June 2005. 2 minute read. I’m joining the Shnjaka expedition in east Carelia this weekend. 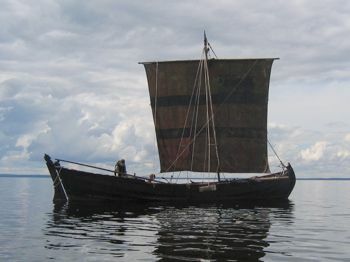 Shnjaka is a viking ship built without a single nail using the old sowing techniques.